Shown below on 20lb bond white paper. Other papers available. * colour runs over 1000 are press run. 7-10 business days on 60lb offset. All files require a 1/4" margin or a surcharge may be applied. Some files may require additional setup charges. This is just a basic guideline for letterhead. 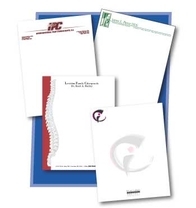 Due to the large variety of paper choices, please contact us with your specifications for a quote.